Trends are continually changing and are often discussed in the art licensing industry. 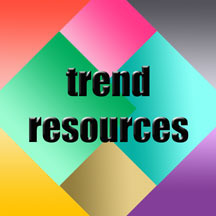 What is a trend?, what is a fad?, do they become "evergreen"?, where do you find trends?, should an artist use trends? were some of the questions answered during the Las Vegas June 13, 2012 Licensing Expo seminar about "Trends: How to Use Them to Complete in Art Licensing." Art licensing agent Suzanne Cruise moderated the panel discussion which included artists Gail Flores and Joan Beiriger. Many examples were shown and many handouts were given to those that attended. Below is one of the handouts written by Suzanne. 1. WHAT IS A TREND: Webster defines "trend" a general direction or movement in the course of time of a statistically detectable change. Trends are all around us. Successfully spotting them early on, and incorporating them in your art is no easy task. They can come out of the most obscure places. Keeping track of fashion is one certain way to spot trends. Colors, styles and even embellishments that started in fashion soon carried into paper, gift and home décor. TV Cable Channels are another great way to spot trends. The Food Network and Cooking channels alone have launched a myriad of programs that trends could be found on, which includes cupcakes, exotic food, hamburgers, organic food, heritage meats, poultry, fruits and greens, sky high and sculpted specialty cakes have all risen to the top of the trend charts. In time, each of these have made their way into paper, home décor and gift products that women scoop into shopping carts. 2. WHAT IS A FAD: Webster defines "fad" as an interest followed for a time with exaggerated zeal. As with trends, fads are all around us but are easier to spot then trends are. Images and even products that appear seemingly out of nowhere and are gone just as quickly include items such as hula hoops, feathers as hair ornamentation, pony tails on men, men wearing shoes without socks. Fads that have come and gone in products that use art: Mini Card (small 3x4 inches) was hot in the mid 80's. Mix and Match cards (match the separate inside with the separate outside) were the late 80's. Recycled paper cards (high usage of low-grade recycled paper) were very big in the early 90's and softened dramatically after the late 90's. Music cards were very big in the mid 2000's, and began to noticeably soften in the late 2000's. Remember the Beanie Baby craze in the mid 90's, now they are not even mentioned any more. Webkinz was a hit in 2006, but the demand and interest in this has dramatically decreased since their all time high. 3. WHEN DOES A TREND BECOME AN "EVERGREEN": Generally speaking, a good selling image or collection usually has a life span of two to seven years, depending on the product. In art, the life cycle of a style/color palette is around four to seven years, after which the consumer interest wanes and they move on to new looks and color palettes. But there are many instances of images that stay in a product line, that continue to sell, year after year. Some examples of this are better known: Thomas Kincade, Mary Engelbreit, Lassen, Debbie Mumm. 4. PLACES TO FIND TRENDS: There are many publications that trends can be spotted in, such as trade magazines, US as well as European fashion magazines, home décor magazines, gardening magazines. Then there are the hundreds, if not thousands of internet web sites that artists have, artists' blogs and tweets, the retailers web sites, as well as the more esoteric sites such as Cool Hunter, Coroflot, going shopping at the retail level to places like Target, the Gold Crown Hallmark Stores, boutiques and gift, walking a few trade shows, eTsy, Pinterest. 5. SHOULD YOU INCORPORATE TRENDS INTO YOUR ART: In a word….YES! But use caution when doing this. If you change your color palette overnight, you stand a good chance of alienating your customer base who is buying your work. But gradually adding new colors and icon trends will keep your work current and fresh, while you are evolving not only your work, but you will be educating the consumer who is buying it. 6. NEW ART VERSUS TRENDY ART, WHAT DOES THAT MEAN TO A MANUFACTURER: With retail recovering in the last couple of years, the demand for art for product is at an all time high. Many retailers do not reorder much product, no matter how well it sells, they constantly want new new new as the consumers are demanding the same. New art is just that, art that keeps pace with the colors and styles that consumers are buying. While trendy art is "new" when it is first gets on the radar, once it catches on, it generally sweeps thru the marketplace and often saturates a range of products in a very short time. The life cycle of a trend is often less than two years, and many times are in the marketplace for a much shorter period of time. 7. DO MANUFACTURERS FOLLOW TRENDS: Many times this depends on the demands of the retailers they sell to. While Target is considered mass market, they are also considered the trendsetters in mass. While Hallmark pays close attention to trends, especially color trends, for the most part they prefer to not be the trendsetter in their product category. They have found this too risky of an investment. There is fierce competition for store space among the over the counter fabric (fabric sold by the yard) companies. Several years ago, one in particular, Cranston Print Works, broke from the pack and invested heavily in classic character licensing (I Love Lucy, Wizard of Oz, Elvis, etc.) and also in art licensing, something almost unheard of in that product category. By doing so, they became the go to OTC fabric company for retailers looking for new, different and exclusive looks, a distinction they hold to this day. In general, manufacturers must pay attention to trends and have at least some of them in a portion of their lines to keep pace with the demands of the buying public. 8. IS TREND FORWARD ART LICENSABLE: Again, this depends on whom the manufacturer is selling to. If they are selling to a Target or Target like audience, or even to a high end retailer whose customers have more exposure to fashion and other trends, their ability to take risks in offering trend forward art on their products are much less of a risk than if they are selling to a retailer whose consumers are not as trend conscious or even trend aware. 9. IS IT BETTER TO BE A TRENDY ARTIST OR TO CREATE ART THAT IS JUST BEHIND THE TREND: There is no right answer for this question. It will totally depend on what your style may be, the subject matter you choose to create and build your library around, your ability to spot trends before they become trends, or not spot them until they are out in the marketplace, what color palettes you gravitate to and how they fit w/ the trend colors, and other factors such as these. Many artists have made a good living creating trend forward art. Many have equally made a good living creating art that is just behind the trend curve. And many artists have made a good living combining the two. Any comments are welcome. Please click on the comments section (below) to write your comment. Text is often used in designs as backgrounds, as a collage of words, to give inspirational messages, and as headlines on greeting cards, decorative flags, and other products. 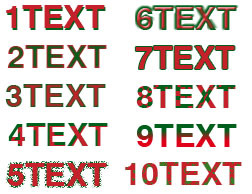 Artists can get the approximate text look they want by choosing from a variety of fonts. And they can then enhance the text by using Photoshop blending options to tweak and embellish it to give it that extra touch or to make it pop and more visible. Blending options include drop shadow, inner glow, inner shading, outer glow, bevel and emboss, satin, stroke, gradient overlay, and pattern overlay. They can be accessed by going to Layer / Layer Style on the command bar at the top of the Photoshop window or by clicking on the fx symbol at the bottom of the layers pallet window. More than one blending option can be used at a time. They are fast to apply so it is easy to create fun, interesting and decorative text. But because it is fast and easy to use blending options, it is also easy to forget that text should be readable and complement the rest of the design; unless the intent is to make the text the central focus. See the illustration at the top of the article for examples of different blending options. Below is a description on how they were achieved. Note: Many more effects can be created by adjusting the controls in the blending option windows. So experiment with them. "Photoshop Tip: Editing Font Characteristics" - Adjusting the font size, orientation, sharpness, alignment, color, and numerous warps by selecting the text and using the controls in the text options bar. I welcome any comments. Please click on the comments section (below) to write your comment.